When it comes to spending your free time there are more important things to do than tending to your swimming pool. Thanks to Cyclean, the automatic In-Floor pool cleaning and circulation system, your pool can be built to clean itself while you relax. Built right into the pool shell Cyclean is engineered to clean your entire pool, including floors, steps, benches, even spas. 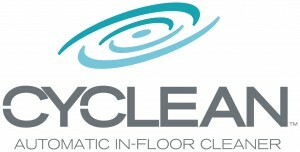 When not operating, Cyclean disappears back into the pool floor, making it virtually invisible. There are no vacuum hoses left floating in the pool. All that’s left is a sparkling clean pool that’s ready to enjoy. Cyclean is custom-designed for your unique pool shape. It is so effective that it will clean more than 99% of your entire pool, guaranteed as well as significantly reduce heating and chemical costs for the life of your pool. Rotating cleaning pop-up jets are placed in floors, steps, benches and even spas to clean the entire pool. These jets work together to sweep debris to the pool’s main drain and skimmer area. The pop-up nozzles push debris from every corner of your pool to the “Patented Collection Zone”, which is an area that stretches across the deepest part of the pool, and from here the debris is directed to the active main drain. The waste then moves to the debris containment canister designed for convenient poolside access. The Cyclean nozzles come in 8 colours to complement any pool interior, and retract flush to the pool floor becoming virtually undetectable when not in use and come with a Limited Lifetime Warranty so you won’t have to budget for a new pool cleaning system every few years. The pop-up nozzles don’t actually touch the pool’s finish and therefore will not leave any marks or damage the surface. The pop-up nozzles and controlling water valve are modular and virtually maintenance free. The Cyclean automatic Watervalve functions as the brain of the system and directs a powerful flow of water to each set of cleaning nozzles. the watervalve requires no routine maintenance, and is also 100% pressure safe. The environment has a serious effect on the maintenance and management costs of a pool. Both heat and chemicals escape the water more rapidly at the surface of the pool due to evaporation. Whilst it is impossible to eliminate that fact, it can be significantly reduced if by returning heated and chemically treated water to the floor of the pool. As the pop-up nozzles push the water towards the collection point, the water is continually circulated, resulting in lower heat and chemical losses and lower costs for you over the life of your pool.